today's first holiday edition of friday creative is a fabulous idea from country living magazine...i just love them! this pretty cluster of pinecones is perfect for thanksgiving all the way through christmas! and it's even better when you add photos! -cut 1 to 2 foot lengths of ribbon and knot one end. 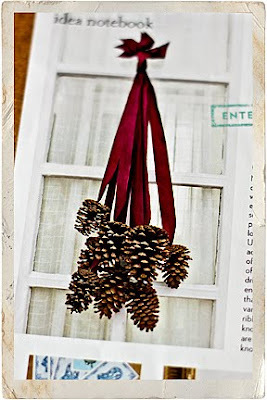 -hot glue the one end, under the knot, to the pinecone. -attach your photos to ribbon as desired...punch a hole in the top and tie the ribbon on; adhere to the back, etc. 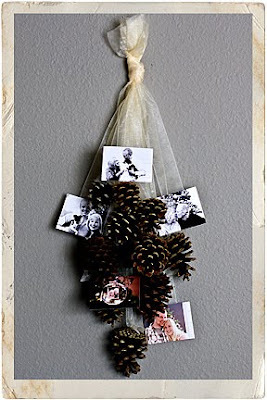 -once all the glue is dry, collect all the ribbon ends and stagger your pinecones & photos together. -tie them to together and trim the top of the ribbon as needed. -hang on a wall or door and ta-da!